Khaya mildbraedii Harms; Khaya euryphylla Harms; Khaya agboensis A. Chev. ; Garretia anthotheca Welw. Khaya anthotheca occurs in the intermediate zone between moist coastal and drier interior zones. It grows best in deep fertile soils on riverbanks. National conservation status in Cote d`Ivoire V, Liberia E, Uganda V/nt. From Sierra Leone and Liberia to Gabon, it extends eastward to Uganda. 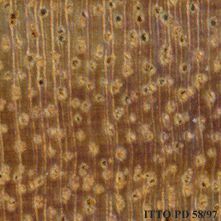 The wood is typically medium in texture. 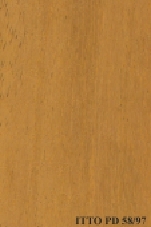 This wood is frequently low in luster. Ease of Drying: Air drying is good. It takes respectively 2 months and 5 months to air dry boards of 13 mm and 38 mm thick. Drying Defects: Risk of end-splitting and surface checking.